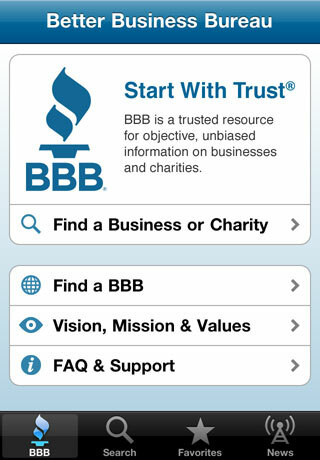 BBB is the trusted resource for objective, unbiased information on businesses and charities. Millions of consumers and companies rely on BBB to research local businesses. Now the power of BBB is available at your fingertips when traveling or on the go. - Search for local businesses by name, phone, URL, or category type. - Search via current location or specified city, state or ZIP code. - Display search results in list or map views. - Access previous searches through the history menu. - View the BBB Business Review for every business listing, complete with BBB Rating, contact info, BBB Accreditation status, consumer complaint history, and more. - Save a listed business’s info to Favorites or iOS contacts. - Share a business’s BBB Business Review URL via email, Twitter, or Facebook. 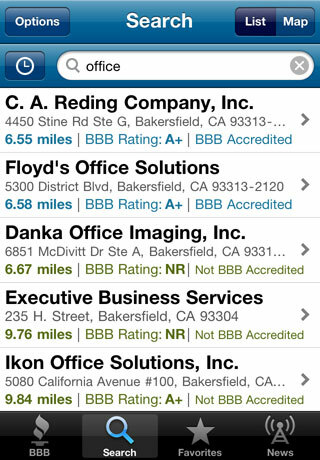 - Find a local BBB near you. - Read the latest BBB Consumer News.